Pielke has been recently highlighted in the Wall Street Journal where he shares his "Unhappy Life as a Climate Heretic". 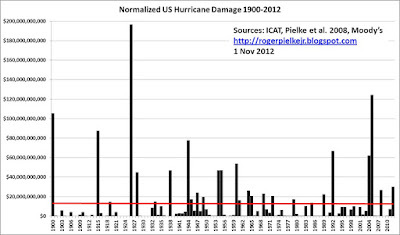 Pielke demonstrates that the frequency and severity or strength of hurricanes (tropical cyclones) has not increased over the past century. 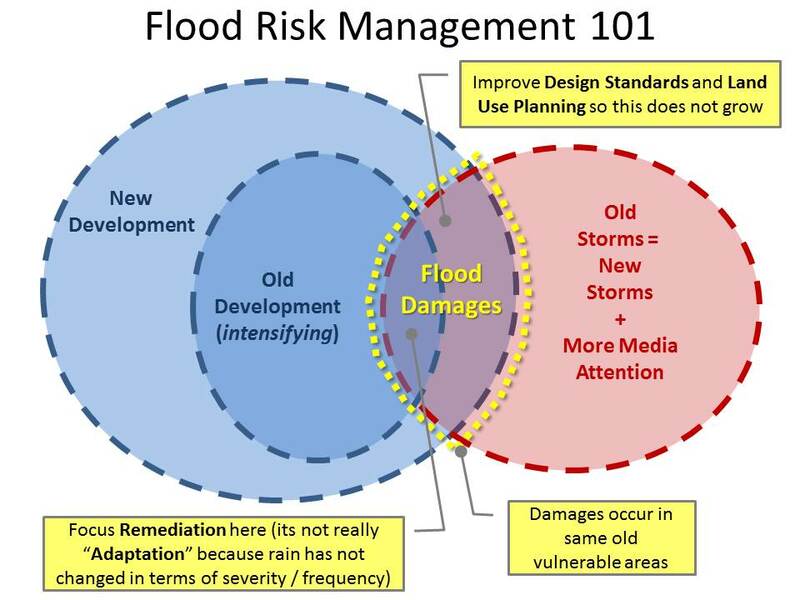 This is good news for Ontario where many river flood hazards are defined by Hurricane Hazel as the regional storm regulatory event in many Conservation Authority jurisdictions. He also delves into damages resulting from these events, normalized to reflect the increase in the number of people and the amount of property in vulnerable areas. While losses have increased it is due to the increase in assets at risk - the normalized damages are in fact 'flat'. 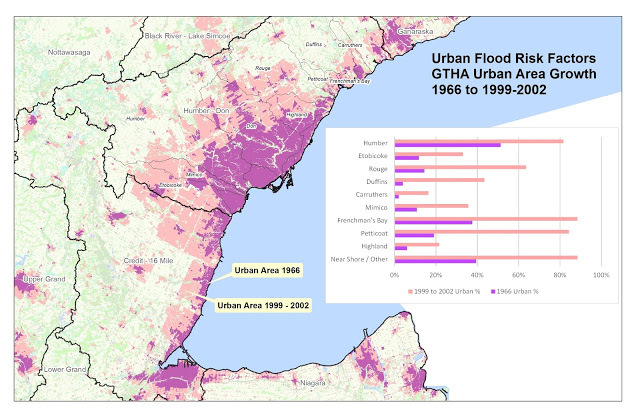 In Ontario, the percentage of properties lie in river flood plains where hazards are governed by hurricane events is in the very low single digits. 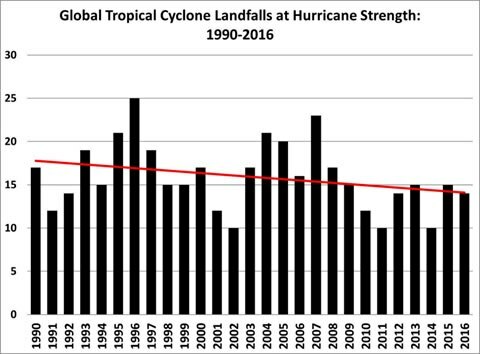 Nonetheless, decreasing hurricane frequency is a good thing. Citing IPCC, Pielke notes that there have been statistically significant decreases and increases in 'heavy precipitation' events, and that there are strong regional and subregional variations in the trends. It is important to note the definition of heavy precipitation is rainfall above the 95% percentile of daily rainfall .. so not really short-duration, high-volume, extreme rainfall that causes widespread urban flooding in Ontario. As reported on this blog, Ontario has regional trends in annual maximum observed rainfall volumes. Charts at right present Environment and Climate Change Canada's Engineering Climate Datasets Version 2.3 trend data. For short durations, less than 6 hour duration, there are four times more statistically significant decreases in maximum rainfall than increases. So southern Ontario regional trends show decreasing rainfall severity. You could "tease out" a teeny, tiny Ontario-wide increase if you average the whole province together, but that would underestimate the increases up north and misstate the decreases down south. Intact has reported on damage trends in their 'insurance is evolving' webpage. They indicate that "Payouts from extreme weather have more than doubled every five to 10 years since the 1980s." and provide the chart at the right. So while losses are increasing, how is GDP increasing in Canada? 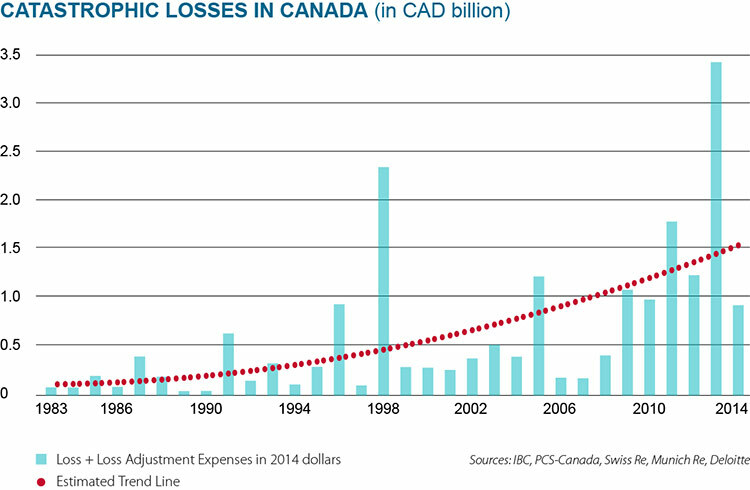 That is, are normalized losses increasing in Canada? Or are those trends like those identified by Peilke? The website tradingeconomics.com provides this Canadian GDP growth chart to the right. Since the early 1980's, GDP has increased about 500% (approximately $300B USD to over $1500B USD). That could explain a portion of the absolute increase in losses since the early 1980's identified by Intact. 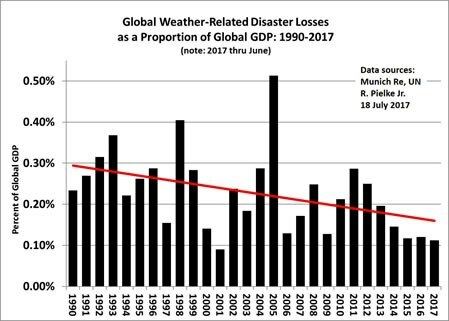 * NEW * using Statistics Canada data for expenditure-based Gross Domestic Product and catastrophic loss data presented by Intact Centre for Climate Adaptation have been used to assess normalized losses as a fraction of GDP. 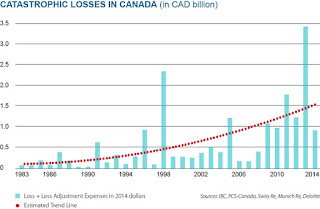 While losses have increased significantly, but the normalized Canadian catastrophic losses are up and down. There is a low r-squared upward trend in normalized losses (i.e., not a strong trend). So using Pielke's 'detection vs. attribution' distinction, one could argue there is a detectable trend upward, however the attribution - what caused it - is unclear. As noted below, we have significant quantifiable upward trends in urbanization in Ontario cities over past decades, suggesting increased runoff stresses under a stationary climate, or extreme weather trends. "Economic growth, including greater concentrations of people and wealth in periled areas and rising insurance penetration, is the most important driver of increasing losses." Wow! 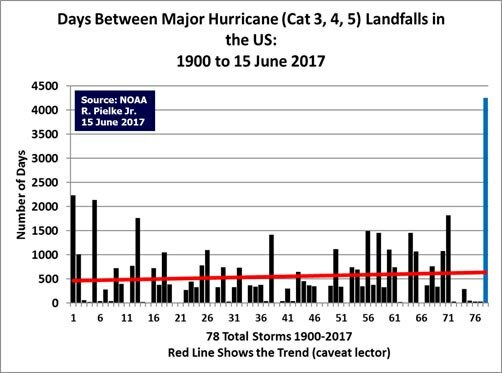 Not much of a trend there to suggest that extreme weather is getting a lot worse - normalized losses are up and down with the maximum relative losses back in 1997 (note the 2014 and 2015 premiums are assumed to be 2% greater than previous years to extend this from 2013 to 2015 where cat loss information was available; similarly 1987-1989 premiums are assumed to increase at 2% to arrive at the reported 1990 value). The r-squared is very low too (0.012) meaning not a strong trend here over time. This muted trend is in stark contrast to the non-normalized losses typically reported by the insurance industry. 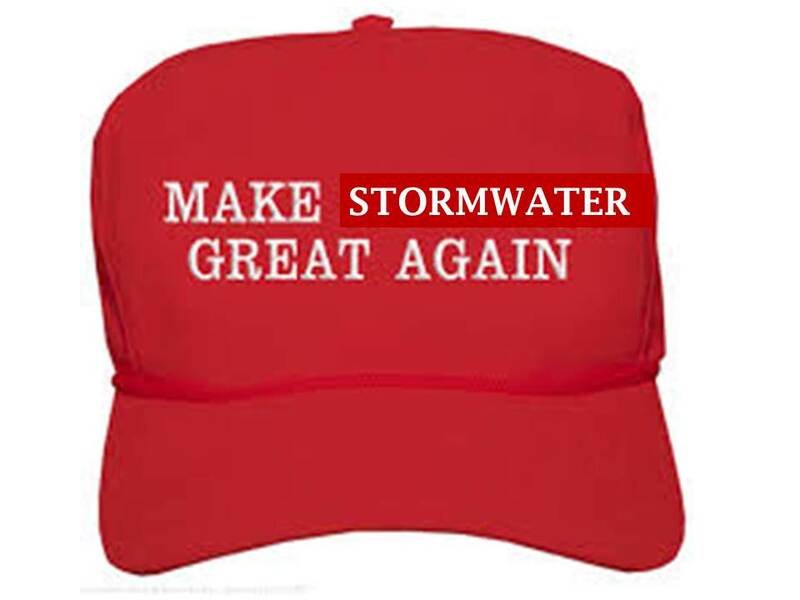 For Infrastructure Vulnerability Assessment and Adaptation to a Changing Climate PRINCIPLES and GUIDELINES, so I guess we can't copyright it. Pielke notes that the reporting on extreme weather has increased considerably, which feeds a public perception that extreme events are increasing in frequency or severity. For example in the New York Times the phrase 'extreme weather' has jumped in popularity in newspaper articles since the mid 1990's. In this blog we have commented on the 'availability bias' that such frequent reporting can cause, skewing the public's perception on the true probability of events. A common statistical sin in such reports is to declare a record rainfall ... umm ... for a particular calendar day (July 8, 2013 in Mississauga, Ontario, or September 28, 2016 in Windsor/Tecumseh, Ontario). Once engineers start design infrastructure to operate differently on different calendar days of the year, such reporting of calendar day rainfall records will be worthwhile, saintly even. But sorry, that's nuts and not going to happen any time soon. Key Take Away - Let's Get Back On Track, Put First Things First, and not be so ideologically driven to predetermined conclusions that we miss the obvious stuff. 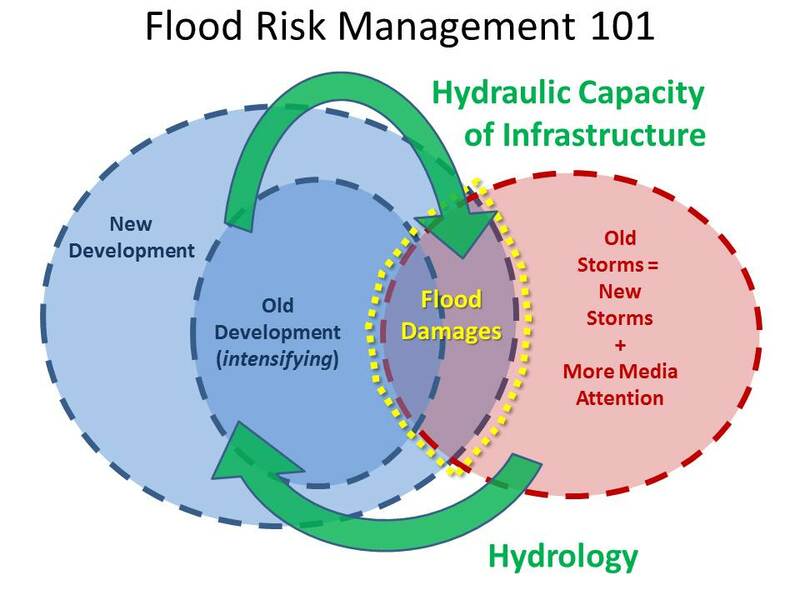 "There is such a furor of concern about the linkage between greenhouse forcing and floods that it causes society to lose focus on the things we already know on floods and how to mitigate and adapt to them." This is from Flood risk and climate change: global and regional perspectives, Zbigniew W. Kundzewicz, Shinjiro Kanae, Sonia I. Seneviratne, John Handmer, Neville Nicholls, Pascal Peduzzi, Reinhard Mechler, Laurens M. Bouwer, Nigel Arnell, Katharine Mach, Robert Muir-Wood, G. Robert Brakenridge, Wolfgang Kron, Gerardo Benito, Yasushi Honda, Kiyoshi Takahashi, and Boris Sherstyukov, Hydrological Sciences Journal Vol. 59 , Iss. 1,2014.
from "flood plain to floor drain". That reference abstract also notes "Economic losses from floods have greatly increased, principally driven by the expanding exposure of assets at risk. It has not been possible to attribute rain-generated peak streamflow trends to anthropogenic climate change over the past several decades. Projected increases in the frequency and intensity of heavy rainfall, based on climate models, should contribute to increases in precipitation-generated local flooding (e.g. flash flooding and urban flooding)." ii) increased imperviousness cover in Ontario municipalities (e.g., mid 1960's to late 1990's). Maybe I didn't learn anything from Pielke's book, like the importance of data and statistical analysis to advance science and public policy. I did learn that the New York Times has a great online tool to analyze the frequency of extreme weather references in their publication. 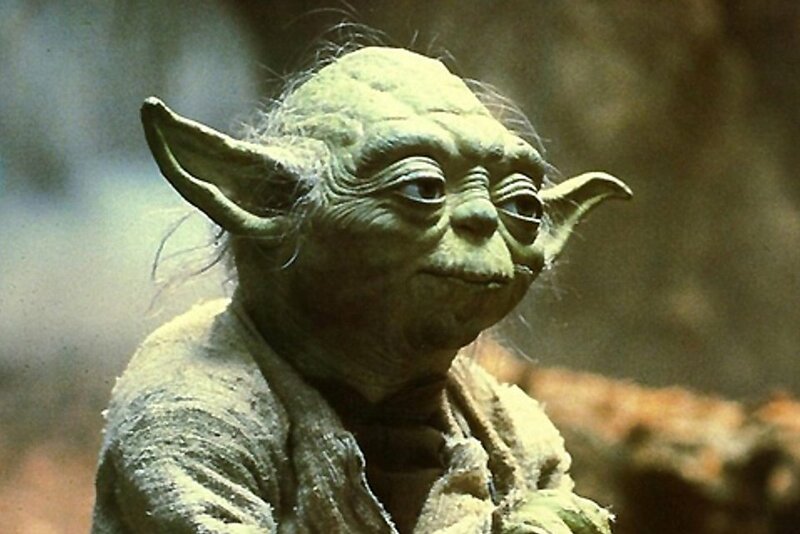 I have used that to help establish some undeniable correlations between extreme weather, twerking and Yoda, as shown in the graphic below. 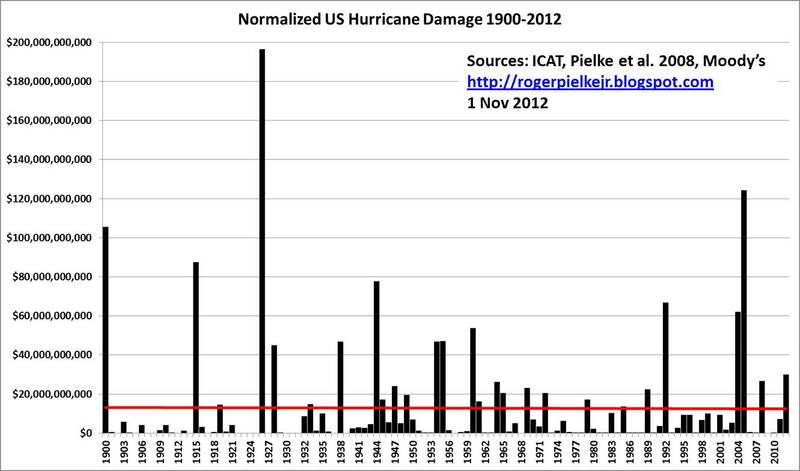 Spurious correlation between temperature and disaster damages you have found? 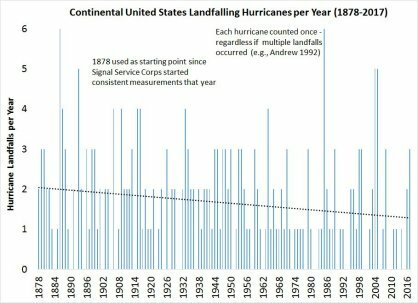 Decreasing frequency of hurricanes making landfall suggests no climate change effects despite 2017 events.